This feature is currently in its final stages of testing and should be available at the end of this week for your app. The Hazard Update feature will allow us to begin to test how well these notifications alert hazards to contractors, so we can look at including more app notifications in the future. Wrapped up in our new improved version 2.0 of the Forsite app, which will look slightly different for users. Along with the Hazard Update feature via the Forsite App, we have also changed some of the permissions of Site Administrators on the Forsite portal online. 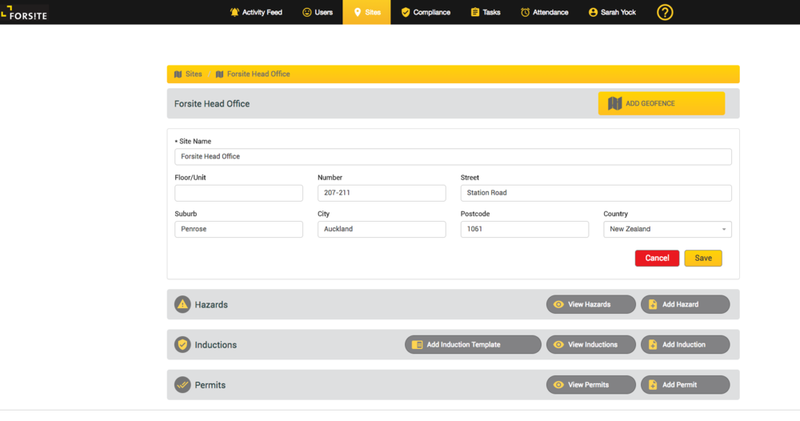 Site Administrators can now add/edit existing Hazards through the Forsite portal. They can also add these to independent sites and where applicable, and can in tandem change the site name accordingly. Our online inductions 'Induct Me' are fully up and running and should allow all users to confirm that contractors are inducted for their initial visit, that during the expiry of an induction for a contractor they will get re-inducted, and that if there are changes to the site, contractors are also re-inducted with new site hazards and information regarding this. We are always looking at ways of improving the health and safety of contractors on site, so please feel free to contact us should there be any comments regarding improving our app, or improving the health of safety of contractors on your site.